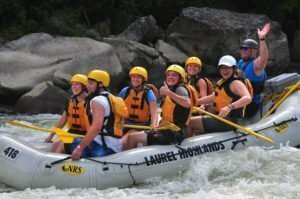 Looking for the BEST way to experience the Lower Yough? Then run the rapids on an Express Tour. This tour debuted in 2016 and continues to be a big hit! You’ll cover the entire 7-mile stretch of the Lower Yough in only 3 hours, giving you time to enjoy more activities on shore like Zip-lining or Rock Climbing. Every raft will have a guide to coach you along the way. And, there is a maximum of 40 people on the tour. So you’ll avoid traffic jams on the river and have an incredible experience. If you are looking for a more personalized and private tour, consider our Premium Guided option. These special tours are all about YOU. You will be pampered away from the larger river tour for a one-of-a-kind expedition. The only thing your guides will be concerned with is your group. With guides handpicked for their experience and congeniality, you will discover much more than just the white water. Your guide will share the history, geology, and ecology unique to this region in a fun and entertaining manner. Our premium guided tour can include a hike up to Cucumber Falls, or a tour of Ohiopyle’s new interactive Visitor Center at the Falls Area. Whatever you want to do or see. This tour option includes a gourmet lunch, private transportation, and special assistance on and off the river. Save NOW for Summer Fun! Trunk of Treats at Yough Lake Campground! Don’t Miss Fall Fun and Savings in Ohiopyle! Labor Day Weekend Fun in Ohiopyle! 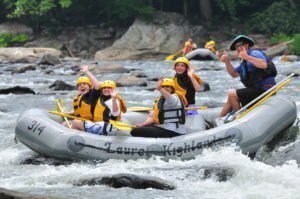 Weekday Fun and Savings in Ohiopyle! Laurel Highlands River Tours © 2019. All Rights Reserved.